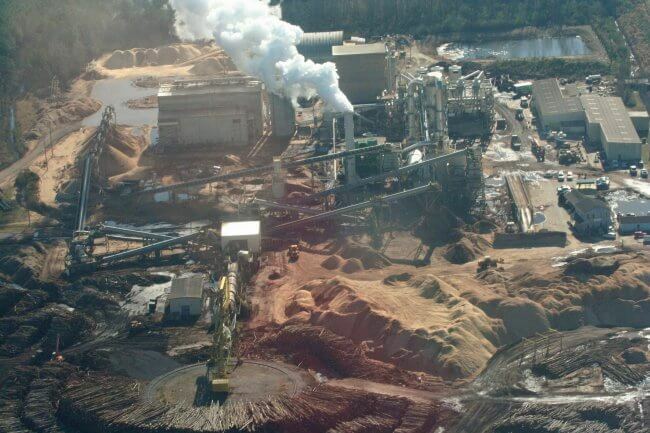 Enviva’s Track and Trace program confirms industrial scale biomass is bad for forests and the climate. Enviva’s “Track and Trace” program, which claims to track every ton of wood that the company buys, confirms what Dogwood Alliance and other organizations have been saying for years: Enviva primarily sources from standing hardwood forests, adding additional pressure to our already over-logged Southern forests and contributing to the climate crisis. 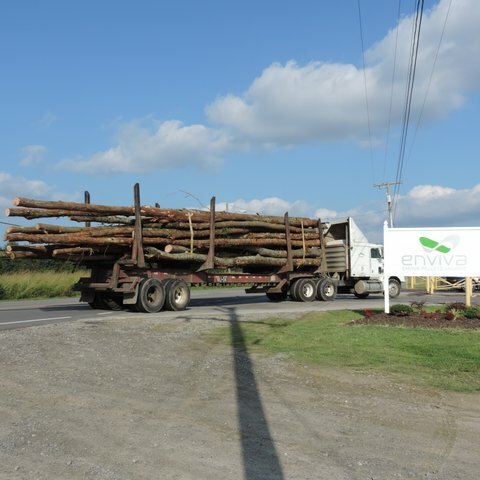 Enviva’s data puts to rest the idea that a majority of their wood is coming from “waste” or scraps, sawdust or even established pine plantations. By their own admission, 81% of their sourcing comes from standing forests, and 58% of their total product comes from hardwood trees. This means a majority of the forests that are being logged and turned into pellets to be burned are coming from natural forests. Therefore, Enviva is increasing logging rates and degrading the health of forests at a time when, more than ever, we need to be keeping our forests standing. The carbon impacts of this practice cannot be overstated and have been proven over and over again in multiple peer-reviewed scientific reports. Adding to the growing list, a recent study from authors at MIT and UMass Lowell showed that when coal is replaced with wood pellets, even when harvested from pine plantations, it releases more emissions than coal and takes 44-104 years to payback that debt—after which time it is still only equivalent to coal, the most carbon intensive fossil fuel. As if that wasn’t enough, peer-reviewed research now shows that even when companies like Enviva burn forest residues, it’s far from being carbon neutral and significantly undermines efforts to address climate change in the necessary timeframes. Furthermore, Enviva’s calculations are suspect and do not hold up under scrutiny. Enviva brags in their infographic that the amount of forested land in their sourcing area has increased by 320,842 acres since 2011. Yet, they do not identify exactly what their “sourcing area” is — because the draft Forest Inventory numbers for the US South for 2017 show a loss of 2 million acres in the South, and a loss of 757,000 acres in the four states where Enviva operates (FL, MS, NC, VA). Instead of using easily accessible and published numbers from the US Forest Inventory and Analysis (FIA) program, Enviva chooses to estimate yearly acreage for 12 states in their Forest Trend map. As a result, the data that they present are not easily reproducible for verification. This may be because they want to show “growth” in forest area, and US Forest Service numbers do not back that up. The numbers about forest growth are completely misleading and paint a false picture to the public that our forest ecosystems are healthy. 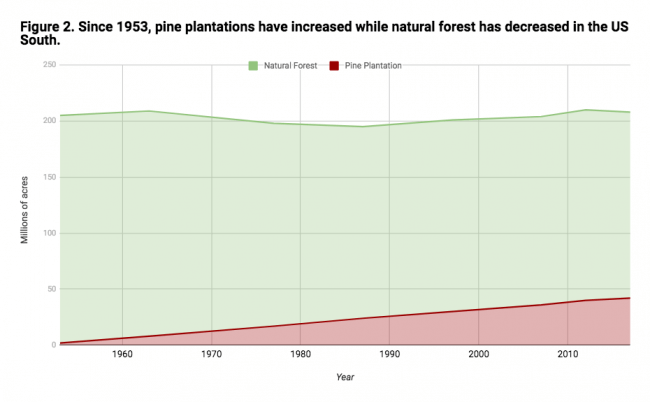 In fact what these numbers are really showing is a growth in pine plantations. 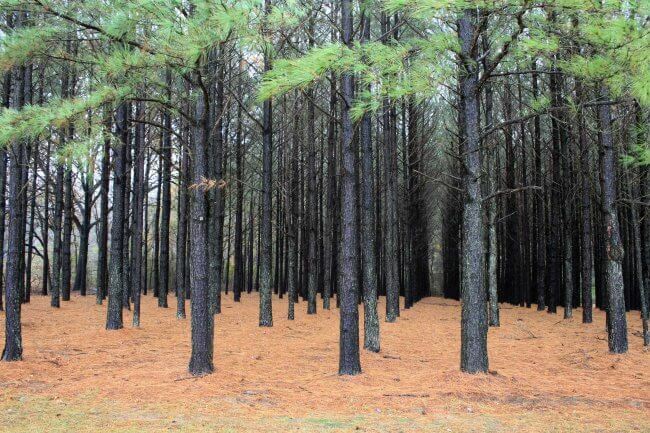 According to the US Forest service’s own data, since 1953, we’ve lost more than 37 million acres of natural forests, while pine plantation acreage has grown by about 42 million acres. It’s important to know the difference between what Enviva means by “growth” and the type of growth needed from our forests to address the climate crisis and protect our coastal communities from extreme weather events. If a natural forest or pine plantation in the US South is clear-cut, that barren land is still classified as “forest” that is “growing”. By this narrow, pro-extraction definition, as long as the land does not convert to another use (eg. a parking lot), then it doesn’t matter if the entire forest ecosystem is completely destroyed. It still counts as a forest contributing to overall “growth”. In the context of addressing climate change and carbon emissions, which Enviva boldly proclaims to do, this is a huge problem. To stop climate change at just 1.5 degrees Celsius of warming, we must do more than stop using fossil fuels. We must remove large amounts of carbon from our atmosphere. Keeping our forests standing is the only proven natural technology that can do this. Instead, we have companies like Enviva proclaiming that they are the climate saviors while continually emitting needless extra carbon into the atmosphere. Enviva’s track and trace system simply misses the point on why their business model is bad for forests, communities, and the climate. The type of forest that Enviva is logging to be turned into pellets and their current scale of operation are increasing carbon emissions and moving us in the wrong direction for addressing the worst impacts of climate change. Adam has a passion for organizing people and fighting the corporations whose practices destroy our earth. While attending UNCA, where he graduated with a BS in Environmental Management and Policy, he began his career in activism as an intern for Dogwood Alliance. Since then, Adam has worked with several organizations to fight coal plants, protect our public water systems and build the sharing economy. In his spare time, Adam loves spending time on/in the rivers of Western NC.